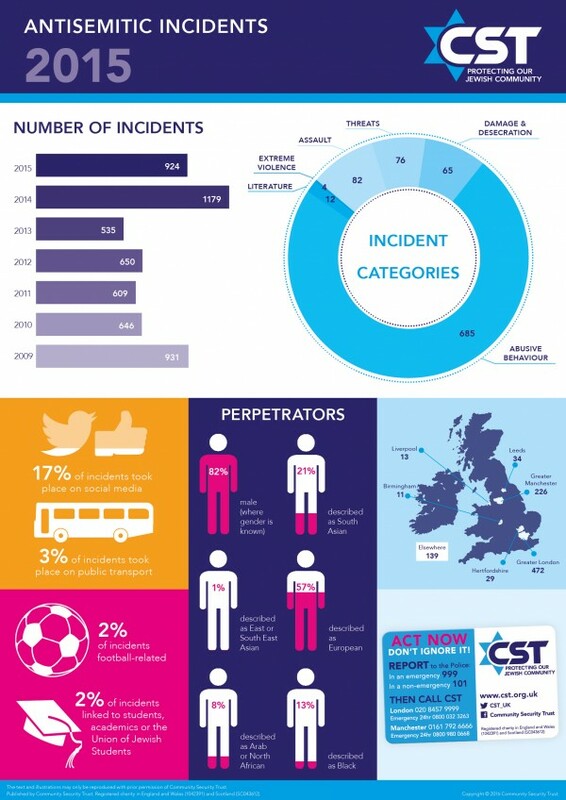 CST’s Antisemitic Incidents Report 2015, published today, demonstrated that 2015 saw the “the third-highest annual total of antisemitic hate incidents in the UK” since such incidents have been recorded (in 1984). Interestingly, CST notes that while 2014’s record high of 1,179 incidents were largely “caused by antisemitic reactions to Israel’s war with Hamas, and “the second-highest total of 931 incidents came in 2009”, also a year when there was a war in Israel and Gaza, there was no similar ‘trigger event’ in 2015 to explain the high annual total. You can read CST’s summary of their report, here. The full PDF report is here. So 43% of the perpetrators of anti-semitic attacks were South Asian, East or South East Asian, Arab or North African or Black. The 57% of Eurotrash anti-semitic attackers were motivated by dishonest news reports by the BBC, Der Guardian, Independent, Sky. Where in the CST report is the content about attacks being motivated by the BBC? I can’t seem to find it? I direct you to the Balen Report – a report critical of the BBC, suppressed by the BBC. There’s something rotten in Londonistan. I know about the Balen Report, I remember the Supreme Court ruling on it. So basically you’re inferring – based on a report you haven’t seen and a piece of statistical research that doesn’t hazard reasons for its findings – that anti-Semitism in “Londonistan” (an offensive, xenophobic term) is actuated by media coverage that you disagree with. You might want to pad that thesis out with a few bar charts or something. Why can’t people see the Balen report??? What is the BBC hiding?????? Unfavorable conclusion that the BBC is BIASED, UNFAIR, DISHONEST, PRO-APARTHEID PALESWINE??? Perhaps you’re right (although the fact that a document is kept confidential doesn’t necessarily mean it says those things: I’m not going to show you a copy of my annual appraisal from my employer, but I promise it doesn’t say I’m biased, unfair, dishonest and pro-apartheid). And I do agree that it should be released, whether under the Freedom of Information Act or otherwise. That’s transparency and democracy. But even if the Balen Report does say those things I think it’s a bit of a stretch to attribute violent anti-Semitism to biased media coverage without any empirical evidence? You’re comparing a review of your performance at some job to a review of an organization that people are forced to fund with the License Fee??? You’re joking right? The BBC has a degree of importance and influence, and that means that the BBC should be held to the Highest Standard of Journalistic Ethics. When the BBC lies and places the fate of savages who knife people above that of the victims – then the BBC has lost its standing. That wasn’t the comparison I made, try re-reading. But that’s exactly what you did when you brought up your performance review and its privacy comparing it to the Balen Report on the BBC. You really are a moron. Your latest reply is as usual weak and ineffectual. another idiotic ‘argument’ full of fallacies that would fail a first year student. The Wiki link you give @ https://en.wikipedia.org/wiki/Balen_Report omits one very important detail. Allegations of BBC bias had been made by people on BOTH SIDES of the I/P conflict in the run-up to the Balen Report. Given that you don’t have the faintest idea what Balen’s findings were, you are remarkably confident that they must have fully vindicated the pro-Israel complainers’ case. Perhaps you should consider this – that the report was kept under wraps because it found Palestinians to have been unfairly treated by the Beeb and too much bending-over-backwards to please the Israeli side. Just imagine what a storm THAT would have provoked! The moron, Edward, is also obviously unaware of the Glasgow Media Groups study headed by professor Greg Philo which concluded that the BBC is systematically biased in favour of the Israeli-Zionist position. Danny boy, so WHY is the Balen Report suppressed???? It was written in 2004 – 12 years ago. What are they waiting for??? If the Balen report comes to the same conclusion as the scottish media group study, let the world see BOTH and weigh the honesty of both.